I’ve debated whether or not to feature GoFundMe campaigns on this blog. On CashSherpa I feature a lot of crowdfunding campaigns specifically from Patreon and Kickstarter, but rarely GoFundMe. My goal with featuring these crowdfunding campaigns is to get the word out for new cool ideas, new tech, and to make a difference in someones life. That’s why I decided to feature this college students campaign. The student goes to Full Sail University and wants to major in arts, where he creates digital artwork. 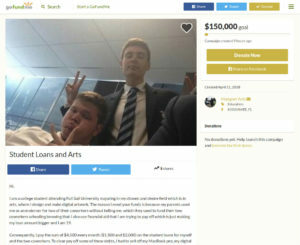 Of course selling these items wasn’t enough and that’s the reason for this GoFundMe campaign in the amount of $150,000. Any amount will be appreciated by this college student. No donation is too small. Best of all anyone that donates to this campaign will receive free custom artwork. That’s a reason to give to this campaign right there. Consider donating to the Magnet Art GoFundMe campaign today. 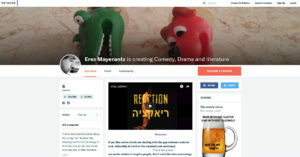 Erez Mayerantz is creating comedy, drama, and literature on Patreon and needs your help. One of the best things about Patreon is anyone can join, it allows artists to quite their day jobs and become a creator full time. At least that is the goal, but it doesn’t always work out. With Patreon you still need to spread the word, so I’m happy to provide this service on CashSherpa. Once arriving at Erez’s Patreon Patreon you’ll see the statement that this page is for those of you who like “works which are dealing with the gap between science and rationality in front of the mystical and emotional.” Sign me up! I’m definitely one of those people. Erez Mayerantz wants to inspire people with his art. Erez Mayerantz holds a BA degree in Philosophy and Comparative Literature from Bar-Ilan University (Class of 2004). From 2008 to 2009 he wrote a satirical column in “Nana 10” portal, and a series of sketches which was published on the web and also on the radio. Between the years 2013 to 2014 Erez has hosted a radio show named “On the edge of the scale” in Radio Sol. Erez has a passion for what he does, but in order to contribute to humanity further this Patreon is very important to get started. Right now there are only 8 Patrons, he has a long way to go and needs your help to meet his funding goal. Play writers like Brecht, Hanoch Levin and Beckett alongside by authors like Bores, Grass, Kundera, Vonnegut and Kleist Also, the Jewish tradition, Christianity, motifs from popular culture and elements out of alternative rock. 4 of his plays were produced in Israel including “Shkembe” (Short) 2006, Tzavta theater. “Climbing vegetables”, in Karov theater and also at “Habima” – Israel national Theater. “Reaction”(Monodrama) at Israel Festival (2014), “Abutbul concern” (2016) at the “Citizen here” festival in Karov Theater where he won the Human Rights Art Works Prize. Yes, there are several rewards to this campaign. $1 gets you a big thank you and jokes. $3/month gets you advice. $5 gets you monthly English story and thoughts. $20 per month gets you monthly conversations with Mayerantz. This is the support level I’d take advantage of, what a deal! The pledge level tops out at $50/month and that gets you all previous perks plus a surprise. Mayerantz as you can see is a very talented artist. He’s already proved himself by what he’s accomplished so far, even winning the Human Rights Art Works Prize for Abutbul Concern. In order to focus more time on his work Mayerantz needs additional funding through Patreon. Please consider contributing to the campaign today. Are you a big punk music fan? If the answer is yes there’s a very interesting campaign on Patreon looking for support. The site that needs patrons is called PunkPit.com. 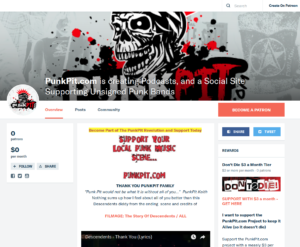 Punk Pit produces Podcasts and also provides a social network who’s sole goal is to support unsigned punk bands. The goal in the end is to get the world exposed to more punk music, that’s why they need support first. Please check them out and consider supporting this punk themed Patreon crowdfunding campaign today. PunkPit needs your help! So far they have no Patreons. PunkPit.com the forth coming punk music / lifestyle social network website If You like the following: Misfits, Bad Religion, Bayonne Bleeders, Johnny Cash, Bouncing Souls, The All, etc. etc. than this place is for you. Art from their FB page. If you like it do yourself a favor and like their FB page. Really cool photos and art on their. Yes, there are several valuable rewards for this campaign. Support at the $3/month level you’ll receive a HUGE thank you and shout-outs from time to time. $10 or more per month gets you guaranteed monthly shout-out also all previous rewards. The $3 and $10 levels are a great way to use their influence and get your band name out there or just some some love to the punk community. Want to connect with them? There’s many ways. Punk music I have to say is difficult to come by just flipping on your local radio station. I’m a kid of the 90s and can remember punk being one of my favorite forms of music in high school. If you want to see punk music continue to thrive consider supporting the folks at PunkPit.com today via Patreon. Stein Bock Games was created by Jin Woo Moraes a student of Game Design. 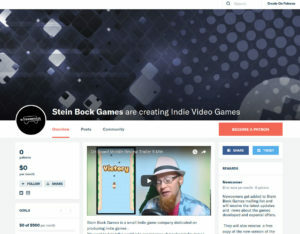 Jin Woo created Stein Bock in order to share his passion of game making with the world. His personal goal is to bring innovation with each game that he released and work his way up eventually to develop virtual reality games. One of Stein Bock’s indie game title is called On Board. Watching the video (Below) it kind of reminds me of Raiden, but on the sea. Check it out below. What do you think? Leave your comments in the comment section what you think of this game. The goal of this campaign is $500 per month. The $500 per month will help make a new and improved version of his game called “On Board Mobile.” This game is currently available on Google Play Store. The new features will include a credit section, two extra levels, high score board, and new sound track. Yes, there are several rewards to this campaign. $1 or more per month gets you on the Stein Bock mailing list. $5 gets you access to behind the scenes game development content as well as added to Stein Bock Games mailing-list. You will also receive a free copy of the new version of the game “On Board Mobile” for Android that is currently being developed. The rewards go all the way up to $50. $50 will get their names added on the game credits, will receive a free copy of the new improved version of the game once is complete, a twitter shot out and follow, have access to behind the scenes game development content as well as added to Stein Bock Games mailing-list. They will also receive a free copy of the new version of the game “On Board Mobile” for Android the is currently being developed. If you like indie games and like Stein Bock’s main title “On Board” consider donation to Jin Woo Moraes Patreon campaign today. Ringnald’s goal is to establish a growing and knowledgeable community around important information one needs to keep pace with the growing world of digital currencies. His vision is to create a comprehensive resource that including articles, videos, interviews and up-to-the-minute news from around the world. – Periodic longer essays, and daily tweets. 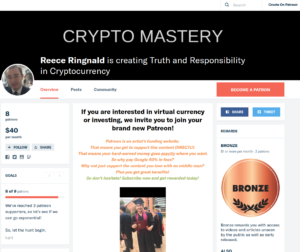 – Learn technical analysis, termanology, and more! Newcomers are welcome. – Depending on the funding generated by this new Patreon campaign in the future there may be psychical products as well. Yes, there are several rewards. $1 or more per month gets you videos and articles early and content not seen by the general public. Also as a bonus you get one video topic request per month. $5+ gets you all previous, name in the credits, and two video topic requests. $10 or more gets you all previous, and access to owners business phone line. $20 or more per month gets you all previous and MP3 downloads of all content. More benefits to come says the site. The importance of cryptocurrency in the financial world and our personal lives has just begun. Everyone is staking out a position and many of the foundations are shaky. Why not support a news site/information source who’s stated goal is to provide truthful and responsible information to the public? Consider support Ringnald’s Patreon campaign today. The You Caring campaign all started when Mary Matthews had the opportunity 3 years ago to purchase a 14,000 square foot building. This huge 14,000 square foot building was once the agricultural cooperative in her small town. At the time she was renting a room at a nearby dance studio and had recently become overwhelmed with the growth in number of students. So on a whim and a prayer, she signed herself up for failure almost instantly as they approved my purchase. The 14,000 SF building instantly became a money pit. One that we was determined to get out of and succeed. Only problem there was so much to do, so many expenses, it was getting the best of her and her business. That’s where this campaign comes in, it will help the community center stay operational and continue to help the surrounding community. If you are like me you know the value in sports and physical activity especially when your in school. There are few things that build confidence and character more than sports. It is so important that people learn the value of physical activity as a catalyst to succeed in life. Help Mary Matthews keep the community co-op alive and donate to the campaign today.